My favorite moment in Dead Cells so far came right after I won my first boss fight. I gained the ability to make climbable vines sprout from certain surfaces, allowing me to access areas I hadn’t previously been able to. Classic Metroidvania stuff, right? 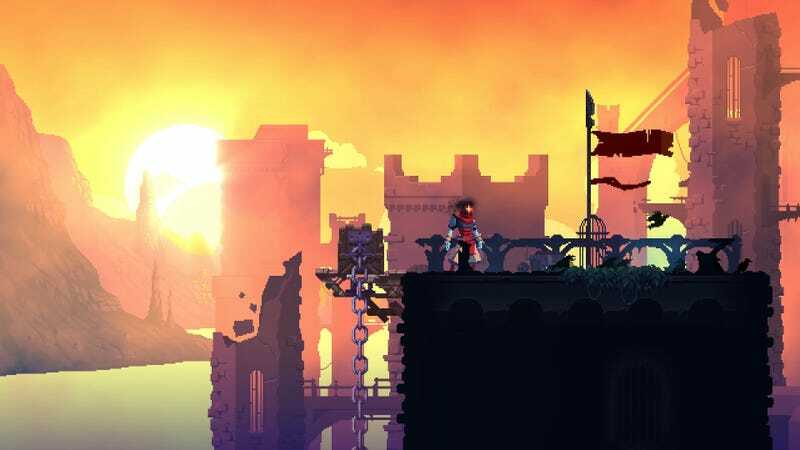 The twist: Dead Cells’ levels, unlike those of a Castlevania or Metroid, aren’t permanent. But my new ability was. Dead Cells is the latest game to break into Steam’s top ten best-sellers list, and though it’s still in Early Access, it’s got a lot going for it. Broadly speaking, it’s a classic side-scrolling Castlevania-style game, but each time you die, the castle (and presumably also the vania) reorganizes itself. Each time you die, you start again from the beginning. Also, your perpetually dying—but never actually Dying—dude doesn’t have a head, and there’s probably some kind of story there? Combat takes cues from Souls games, meaning that this one is a Metroguevania Souls-lite. It’s the zeitgeist incarnate, the video game-est video game. Do not, however, take my facetiousness for derision. Dead Cells is about as far from a cynical genre mash-up as it gets. Instead, the game smartly dissects what’s so exciting about Metroidvanias (exploring labyrinthine levels packed with variety, unlocking new abilities that re-contextualize areas you already passed through) and reassembles those things around a compulsive roguelike core. Let’s use the power I talked above unlocking above as an example. By that point, I’d already tried to conquer the castle three or so times, but I died shortly after reaching the second (very different, visually and design-wise) area. When I finally beat the first boss—an “elite” version of a normal archer enemy—I’d already stumbled across numerous little green blobs that I could “tickle” scattered through various versions of the game’s first area. I had no idea what they were for. Turns out, they’re conduits for vine creation. “Neat!” I thought. Then a monster in the third area killed me. While my weapons and money disappeared into the abyss, my new power was permanent. That meant I could explore new nooks and crannies in future configurations of the first area, as well as the game’s other locations. Roguelikes and roguelites are so devastatingly addictive in large part because each death represents a new world of possibility. Metroidvania-style power unlocks, complete with new exploration possibilities, dovetail beautifully with that. Better still, there’s none of the dreaded backtracking Metroidvanias sometimes over-indulge in. When you die, that part happens automatically. I’m surprised nobody did it this way sooner. You might worry that random generation is at odds with a great strength of Metroidvania-style games: hand-crafted, personality-packed level design. It’s a valid concern. I can’t say exploration is quite as exciting as it is in a great Castlevania, if only because levels are impermanent. That said, I’ve been impressed by the internal consistency of each main area, even as they change each time you die. The first area is always a dank, relatively straightforward sewer. The second area is a multi-tiered forest where you can proceed along a combat heavy topside or go underground and traverse a series of trap-ridden jumping puzzles. The third is a series of jutting towers and crumbling rooftops framed by a waning sun. And so on. Each introduces new enemies and gameplay elements. There’s much to discover. There’s also plenty of more ephemeral things to unlock—like weapons, bombs, and potions—though even those things can be upgraded over time. Unfortunately, I’ve found combat to be a bit weak so far. Striking enemies feels good and weighty, and dodging/rolling is fun, but enemy types are pretty predictable. You’ve got your melee guy, your faster melee guy, your explode-y spell guy, your regular spell guy, your flying guy, and your arrow guy. The boss enemies I’ve encountered are just buffed up, faster versions of those, rather than the unique, sometimes screen-filling bosses of a good Metroidvania. In Dead Cells’ defense, however, almost every enemy presents a slight twist on their archetype. For instance, the melee guy leaps at you, slamming you back instead of simply swinging a weapon, so you’ve gotta stay on your toes, and the first spellcaster you meet doesn’t fire magic missiles so much as he lobs mystical grenades. Admittedly, I’ve only played for a couple hours. For all I know, things get way more elaborate in later areas. And of course, Dead Cells is still in Early Access, with the developers hoping to double the amount of levels, enemies, bosses, and skills in the game before its full release. Still, this is one of those Early Access games that’s remarkably polished and full of Stuff (TM) for where it’s at.